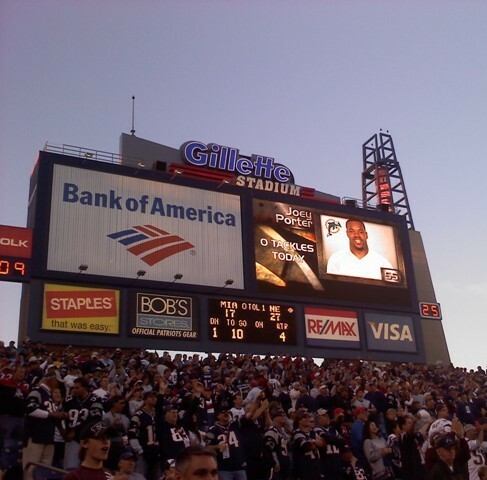 For Joey Porter it’s a good thing that the Dolphins beat the Patriots yesterday because otherwise he would have looked like an even bigger douche. The first contest between these two teams featured plenty of jawing from Porter before the game, and then little from him DURING it. In fact he finished the day with no tackles, no sacks and nothing on the stat sheet, something the stadium scoreboard operators thought important enough to point out. Where in the first game he was totally invisible, yesterday he actually contributed, sort of, finishing with 3 tackles and assisting on another one. 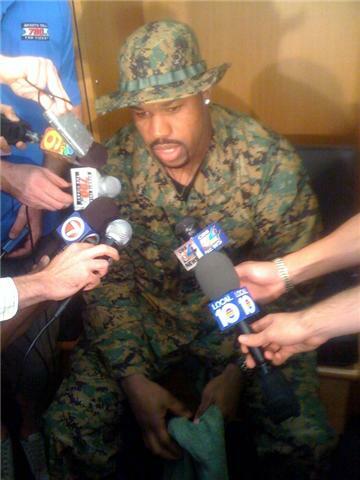 After yesterday’s surprise win over the Patriots, Porter held court in the locker room with reporters and this time he was highly visible, if incredibly poorly dressed. Hey Joey, guess what, you’re a well-paid professional football player, NOT a soldier. You want to be a soldier? Great, go sign up like Pat Tillman did. Otherwise, buy some normal clothes that help you not look like quite as much of an enormous douchenozzle. Also, last I checked, there’s not a whole lot of forests in the Miami area, so, what exactly are you trying to camouflage yourself from, I mean, I can still see you for the tool you are.